Billionaire industrialist Alec Colson calls a press conference and announces to the world that he has proof of extraterrestrial life and a political cover-up. Insisting that the people have a right to know the truth, Colson gives the governments of the world 24 hours to reveal the truth or he will do it for them. Carter and Daniel fly to Seattle to meet with Colson, hoping to convince him not to go public, but neither they nor Colson's business partner, Brian Vogler, can dissuade him. After 24 hours, Colson again addresses the media and presents his astonishing proof - a living Asgard. SG-1 determines that Colson's lab must have used Asgard DNA to grow a clone, but to put a stop to the media speculation, O'Neill calls in a favor from Thor, and instantly Colson's clone and his research vanish in a beam of light. 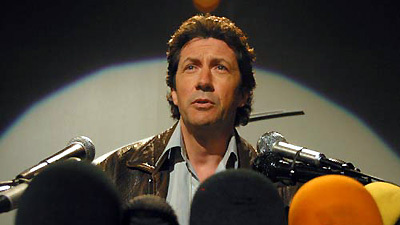 To discredit Colson's claims, Carter appears on Julia Donovan's news broadcast and gives the world the impression that Colson's clone was nothing more than holographic special effects. Meanwhile, Colson prepares to fly to Washington, but his plane is sabotaged and forced to land. Carter proposes a new strategy, to tell Colson the truth, hoping he'll recognize the need for secrecy. Carter gives Colson the tour of both the SGC and the Alpha Site and offers a warning about the Trust, but Colson is more determined than ever that the world should know the truth. Upon returning to Earth, Colson learns that he has been framed for securities fraud, and his corporate empire is on the verge of collapse. Even worse, it was Brian who had been blackmailed by the Trust to turn him in. Despondent, Brian commits suicide, and a guilt-ridden Colson contemplates taking his own life until Carter offers him an opportunity to enter her world of secrecy and begin his life again off-world. After the Alpha Site was destroyed in an attack, it was moved to P4X-650, a forested planet 640 light years from Earth, and the base was built inside a mountain. Asgard DNA is programmed to grow clones to maturity in just three months, but they’re essentially an empty shell until an existing consciousness can be transferred into them. Carter takes first seat as the pilot of the F-302. Alec Colson, age 42, has a net worth of over $60 billion, runs a global empire of companies including communications, biotechnology, aerospace, and aviation, and is number eight on the Fortune 500. He personally holds over 200 proprietary patents, and owns several Earth observer and weather satellites. He is a pilot and a brilliant engineer. Colson’s father was a newspaper reporter who was jailed during the McCarthy Era, and he believes strongly in the freedom of speech. Colson’s wife and daughter died in a plane crash when he was 24, which led to his development of Colson Aviation. Colson Industries’ head office is in Seattle. Colson Aviation developed the multi-engine control systems for the F-302 through a government contract. A Colson biotech research company was given a copy of Asgard DNA by the Department of Defense, for sequencing. Brian Vogler and Alec Colson have been friends since childhood. A clandestine group of private businessmen was informed of the Stargate Program over six years ago by rogue elements of the NID. They are very highly connected, and Kinsey has been linked to them. They’ve been funding various secret endeavors aimed at contolling alien technology for their own purposes. The Trust appears to refer to the combination of the remnants of the Rogue NID and the businessmen of the Committee. They think that Washington abdicated its duty to protect the planet and they see it as their responsibility to step in. Kinsey is specifically referred to as "former vice-president." In layman's terms, we beamed you up.